Who was to blame for the witch-craze? Usually witches were described as malicious, lustful women who had made a pact with the Devil, and who had magical powers over nature. Ordinary people came to believe there was a diabolical conspiracy – a heretical movement of witches. The papacy institutionalized and intensified its persecution of heretics, and assumed a connection between heresy and magic. The universities and scholastics developed an extensive demonology, incorporating formerly pagan superstition into theological system. Church doctrine made the Devil an overpowering figure, believed to be lurking everywhere in the medieval world, and especially working through women, the ‘sisters of Eve’. 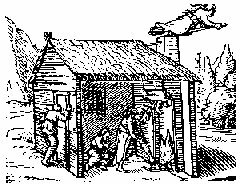 (By the 15th century the Malleus Maleficarum had been compiled, defining what witchcraft was, and it was formally declared a heresy. ) The mendicant orders and their preaching pointed to witches everywhere. The political systems –states and empires – developed the legal system leading to executions. Why the witch-craze? Both Catholics and Protestants believed in witches, and in these centuries no one critically examined this popular belief. (It would be the 18th-century Enlightenment which would finally put an end to the witch-craze.) In small towns and villages, people reacted to bitterness and cursing of individual women. Everywhere, there was general anxiety about solitary women – women not under the supervision of husband or church. Physicians, coming out of the new universities, were hostile to those women who had traditional knowledge of medicine (and contraception). In marriages, women became scapegoats for impotence and barrenness. Clergy celibates often had sexual obsessions and fantasies. What questions would you ask to identify reasons for the fear of ‘witches’ that spread during these centuries? Are there similar fears of women in today’s cultures? How do you see those fears exposed in societies around the world? How can we support and defend women at risk in these times of deep cultural anxiety?